This is a Jest HTML reporter. It takes summary test results from jest and parses them into an HTML file for improved readability and filtering. jest-stare when used as a reporter updates the HTML report on each completed test run. 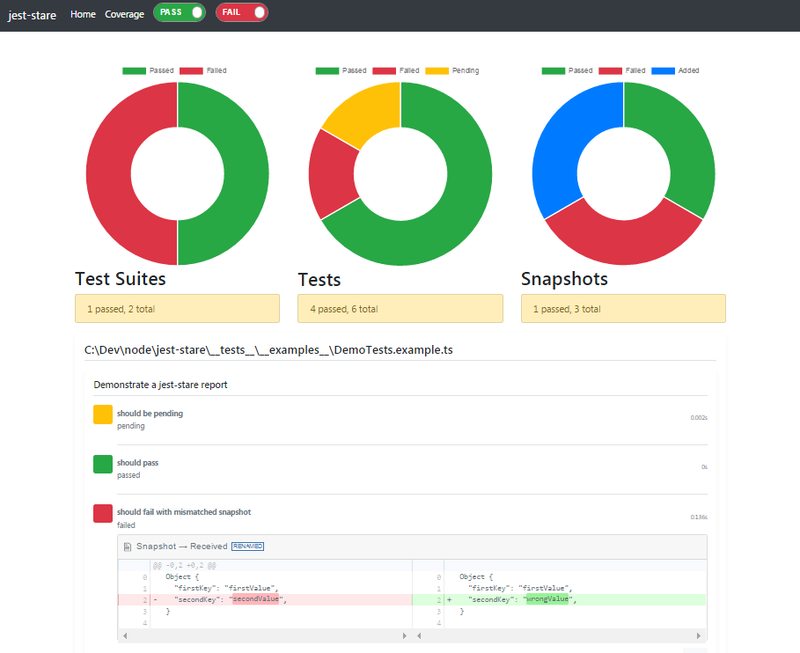 You can use this to view test output that is incomplete (before each test suite completes). Refresh your browser to see new tests as each suite completes. You can also configure each option via environmental variables instead. Environmental variables take precedence over values in package.json. CLI options take precedence of environmental variables and configuration. resultDir JEST_STARE_RESULT_DIR jest-stare set the results directory "resultDir": "results/jest-stare"
resultJson JEST_STARE_RESULT_JSON jest-results.json indicate the raw JSON results file name "resultJson": "data.json"
resultHtml JEST_STARE_RESULT_HTML index.html indicate the main html file name "resultHtml": "main.html"
log JEST_STARE_LOG true specify whether or not jest-stare should log to the console "log": "false"
jestStareConfigJson JEST_STARE_CONFIG_JSON undefined request to save jest-stare config raw JSON results in the file name "jestStareConfigJson": "jest-stare-config.json"
jestGlobalConfigJson JEST_STARE_GLOBAL_CONFIG_JSON undefined request to save global config results in the file name "jestGlobalConfigJson": "global-config.json"
coverageLink JEST_STARE_COVERAGE_LINK undefined link to coverage report if available "coverageLink": "../../coverage/lcov-report/index.html"
Use the jest-stare CLI to create or recreate an HTML report. You only need to supply an input JSON file containing the jest test results. You can invoke jest-stare as a CLI after installing globally via npm install -g jest-stare. Thanks to dogboydog for additions to configuration!